Last 19 missing after deadly Nairobi hotel attack now accounted for- Red Cross - SABC News - Breaking news, special reports, world, business, sport coverage of all South African current events. Africa's news leader. Kenyan policemen and explosives experts gather evidence from the car suspected to have been used by the attackers outside the scene where explosions and gunshots were heard at The DusitD2 complex, in Nairobi, Kenya January 17, 2019. Nineteen people still missing two days after a Somali militant attack on a Nairobi hotel and office complex that killed 21 people are now accounted for, the Kenyan Red Cross said on Thursday. Late on Wednesday, the Red Cross had said it had yet to account for 19 of 94 people it had been tracing. “All 94 cases have been closed positively as of (now),” it said in a statement at 12:30 p.m. (0930 GMT) on Thursday, giving no further detail. 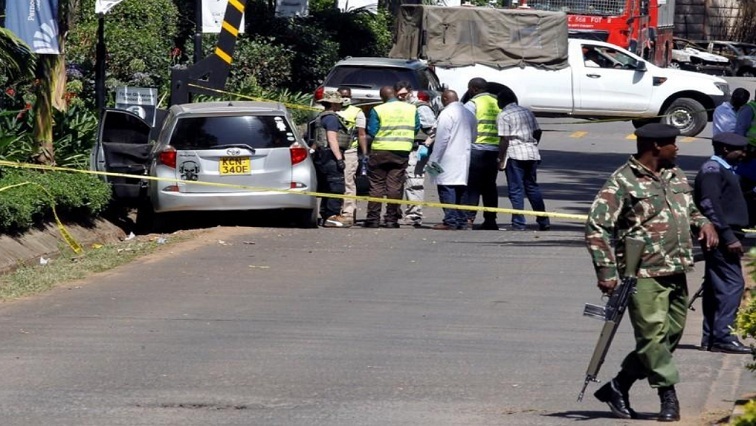 Sixteen Kenyans including a policeman, an American survivor of the Sept. 11, 2001 al Qaeda attacks on the United States, and a British development worker were among the dead in the hotel 14 Riverside Drive complex, Nairobi police chief Joseph Boinnet said. This entry was posted on 17 Jan 2019,03:56PM at 3:56 PM and is filed under Africa, News. You can follow any responses to this entry through the RSS 2.0 feed. Both comments and pings are currently closed.